For undergraduate Principles of Management courses. With a renewed focus on skills and careers, the new edition of this bestselling text can help better prepare individuals to enter the job market. Management, 14th Edition vividly illustrates effective management theories by incorporating the perspectives of real-life managers. Through examples, cases, and hands-on exercises, you'll see and experience management in action, helping you understand how the concepts you're learning about actually work in today’s dynamic business world. MyLab™ Management is an online homework, tutorial, and assessment program designed to work with this text to engage students and improve results. Within its structured environment, students practice what they learn, test their understanding, and pursue a personalized study plan that helps them better absorb course material and understand difficult concepts. Note: You are purchasing a standalone product; MyLab Management does not come packaged with this content. Students, if interested in purchasing this title with MyLab Management, ask your instructor for the correct package ISBN and Course ID. Instructors, contact your Pearson representative for more information. STEPHEN P. ROBBINS received his PhD from the University of Arizona. He previously worked for the Shell Oil Company and Reynolds Metals Company and has taught at the University of Nebraska at Omaha, Concordia University in Montreal, the University of Baltimore, Southern Illinois University at Edwardsville, and San Diego State University. He is currently professor emeritus in management at San Diego State. Dr. Robbins’s research interests have focused on conflict, power, and politics in organizations, behavioral decision making, and the development of effective interpersonal skills. His articles on these and other topics have appeared in such journals as Business Horizons, the California Management Review, Business and Economic Perspectives, International Management, Management Review, Canadian Personnel and Industrial Relations, and The Journal of Management Education. Dr. Robbins is the world’s best-selling textbook author in the areas of management and organizational behavior. His books have sold more than 76 million copies and have been translated into 20 languages. His books are currently used at more than 1,500 US colleges and universities, as well as hundreds of schools throughout Canada, Latin America, Australia, New Zealand, Asia, Europe, and the Arab world. Dr. Robbins also participates in masters track competition. Since turning 50 in 1993, he’s won 23 national championships and 14 world titles. He was inducted into the US Masters Track & Field Hall of Fame in 2005. MARY COULTER received her PhD from the University of Arkansas. She held different jobs including high school teacher, legal assistant, and city government program planner before completing her graduate work. She has taught at Drury University, the University of Arkansas, Trinity University, and Missouri State University. She is currently professor emeritus of management at Missouri State University. 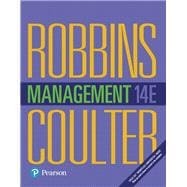 In addition to Management, Dr. Coulter has published other books with Pearson including Fundamentals of Management (with Stephen P. Robbins), Strategic Management in Action, and Entrepreneurship in Action. When she’s not busy writing, Dr. Coulter enjoys puttering around in her flower gardens, trying new recipes, reading all different types of books, and enjoying many different activities with husband Ron, daughters and sons-in-law Sarah and James, and Katie and Matt, and most especially with her two grandkids, Brooklynn and Blake, who are the delights of her life!